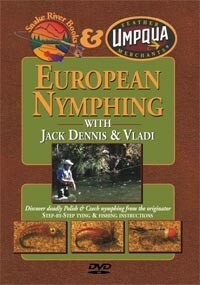 DVD-European Nymphing-Dennis, Learn hot new European Nymphing techniques from Vladi Trzebunia, world fly fishing champion & innovator of the Polish Nymphing technique. Step-by-step, Vladi will tie his famous woven Polish nymphs & the "Vladi worm." Hosted by Fly Fishing Team USA head coach, Jack Dennis covers rigging, casting, flies, knots & more. Go fly fishing with Jack Dennis, Vladi Trzebunia and Team USA as they demonstrate the ins and outs of European Nymphing, including techniques used by French, Polish, Czech, and Spanish anglers. Learn to become a more effective nymph fisherman without the use of indicators. After honing the skills on this DVD, you should be able to double your hookups. Learn casting, rigging, equipment, flies and knots plus a special section on tying. By mastering these skills you should be able to double your hookups and add to your nymphing success in moving water.